Opossums, generally referred to as ‘Didelphimorpias’ are small marsupials that are found in Central and Southern America. Opossums have lived in the Americas for around 55 million years probably evolving from the basic South American marsupials of the late Cretaceous period. They have now spread northwards as far as Canada although those who have are vulnerable to frostbite. There are around 60 species of Opossums, most are the size of a domestic cat or smaller. 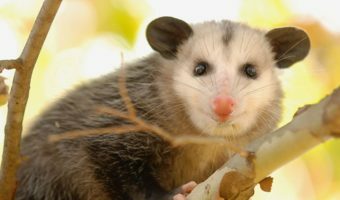 Below, we look at 2 species of Opossum – the Virginia Opossum and the Water Opossum. The Virginia Opossum (Didelphis virginiana) measures 33 – 50 centimetres (13 – 20 inches) in length and weighs around 2 – 5.5 kilograms (4.5 – 12 pounds). They have silver, white faces with darker streaks and a body covered in shaggy long grey and white hairs. They have prehensile tails which are almost furless. Although Virginia Opossums are usually ground dwellers, they are established climbers. As well as a prehensile tail, they have very sharp claws on all of their toes except the large toes on their hind feet which are opposable, like a thumb, which is extremely useful as it enables the Opossum to grasps things like tree branches. Virginia Opossums generally live in forests that receive plenty of rainfall, however, this species is very adaptable and is now making its home in new places across Northern America. Many now survive in more open country besides streams and swamps and other water sources. Others are making homes in peoples sheds and barns. Virginia Opossums are often active at night when it hunts for food. 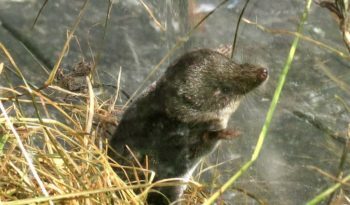 By day, they rest in nests of leaves and grasses or in hollow trees and sometimes burrows. Opossums are opportunists and scavenges and will eat almost anything. Their main foods include plants, small invertebrates and vertebrates and they will even eat carrion. Opossums will also prey on venomous animals such as snakes as they have a higher resistance to snake venom than other mammals. Virginia Opossums do not hibernate, instead, they put on lots of weight (fat) when Autumn is approaching. They rely on the fat to keep them going during periods of harsh winter weather when food is scarce. In the coldest parts of their range, particularly in the north, Opossums can suffer from frostbite to their naked tails and thin ears. Virginia Opossums mate both in late winter and in springtime. Gestation period is 12 – 14 days. The young are 1 centimetre (0.4 inches) in length and are born under-developed as with all marsupials. Usually, over 20 babies are born, however, as the mother can only suckle around 13 at a time, the weaker babies die. Because baby opossums are born under-developed, they stay attached to a teat in their mothers pouch and cannot let go until they are fully developed. Opossums entwine their tails around the tails of their young while they carry them around. Virginia Opossums become sexually mature at 6 – 8 months. Their life span is around 3 years. The Virginia Opossum is classed as ‘Low Risk’ by IUCN. The Water Opossum (Chironectes minimus) or ‘Yapok’ is found in the tropical forests of South America. They are distributed from southern Mexico to Belize and Argentina. Water Opossums measure 27 – 40 centimetres (10.5 – 16 inches) in length and weigh between 600 – 800 grams (1.25 – 1.75 pounds). Water Opossums have waterproof coats which have a grey and black pattern. Their hind feet are webbed and both male and female have pouches. The female can close her pouch using a ring of muscles to keep her young dry while she is under the water. The males pouch is always open and he uses it to protect his scrotum while in the water or when he is moving quickly through the forests. Most Opossums have long snouts and a prominent sagittal crest. Opossums also have more teeth than any other land mammal with very small incisors, large canines and tricuspid molars (having three cusps or points). Their stance is plantigrade which means having their feet flat to the ground. The Water Opossums preferred habitats are freshwater streams and lakes. These Opossums make their dens in the banks of the streams and lakes with entrances just above the water level. This particular species of Opossum links the food chains in water and on land. It hunts in streams and rivers for fish, frogs, crayfish and insects. It then returns to land to rest, sleep and breed and perhaps to be caught by a land predator such as a Jaguar. Water Opossums are excellent swimmers who use their hind feet to propel themselves through the water. Although Water Opossums mainly feed in the water, they have also been known to forage on land or in trees. 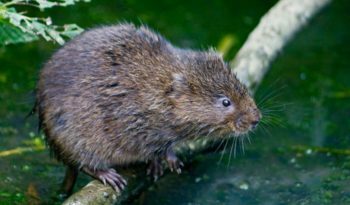 They spend their nights in their water-side dens or they may rest in bundles of leaves in secluded places on the forest floor between daytime feeding forays. Births take place between December and January. After a gestation period of 12 – 14 days around 2 – 5 young are born and spend the first few weeks in their mothers pouch suckling milk from her teats until they are fully developed. The life span of a Water Opossum is 3 years. Water Opossums are classed as ‘Low Risk’.